The Genetics Training Program provides exceptional opportunities to students. Our mission is to train students in cutting-edge genetic and genomic research while providing professional development opportunities for successful career trajectories. The breadth of research opportunities in the program combined with our focus on students and student development makes our program and community one of the top in the nation. The Genetics Training Program is situated within the Laboratory (Department) of Genetics at UW-Madison, but it includes a wide variety of associated faculty whose labs students can join. The training program includes over 70 faculty trainers, whose primary appointments span over 20 departments and multiple colleges. Trainers in our program share the incorporation of genetic and genomic perspectives while collectively capturing the diversity of research questions, tools, and approaches of modern scientific research. Our trainers and program can therefore provide students with a solid foundation in modern and classical genetic / genomic knowledge while exposing them to cutting-edge research experiences. The genetics research pursued on campus, along with the active engagement of our trainers in the program, provides an exceptional community. An NIH Genetics Training Grant, administered by the Laboratory of Genetics, thereby provides to its graduate students the greatest possible diversity and opportunities in modern genetics research. The Laboratory of Genetics is the oldest and one of the finest centers of genetics in the nation. It is highly regarded for its research contributions in the areas of disease genetics, cell biology,neurogenetics, developmental genetics, gene expression, genomics, evolutionary & population genetics, and computational biology. The Laboratory consists of two departments: Genetics, in the College of Agricultural and Life Sciences; and Medical Genetics, in the School of Medicine. Although administratively distinct, these two departments function as one at both the faculty and student levels. The University of Wisconsin-Madison ranks among the nation’s top universities. It regularly ranks among the top U.S. public universities in the amount of research and development funds received from all sources. Its faculty and former faculty include 11 Nobel Laureates, 45 members of the National Academy of Sciences, 7 National Medals of Science, 13 Pulitzer Prizes, 34 Presidential Young Investigator Awards, and multiple Howard Hughes Investigators. The UW-Madison has one of the largest university biological research communities in the world, with over 700 faculty, 1,500 academic staff, 700 postdoctoral fellows, 2,500 graduate students, and thousands of undergraduates. At the same time, close-knit communities ensure a supportive but diverse environment in both research and education. 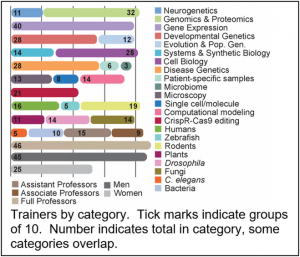 Many departments at UW-Madison rank among the top in their disciplines, including the Departments of Bacteriology, Biochemistry, Chemistry, Chemical Engineering, Computer Science, Genetics, Plant Pathology, Oncology, Statistics, and others. In addition, UW-Madison fosters significant interdisciplinary collaboration and communication. Many of our students and trainers attend a broad range of seminars and community meetings that span traditional disciplines. UW-Madison also houses a number of internationally recognized research centers and facilities, including theBiotechnology Center and the Genome Center, the UW Carbone Cancer Center, the J. F. Crow Institute for the Study of Evolution, the Center for High Throughput Computing, the Wisconsin Institutes for Discovery, the National Magnetic Resonance Facility, Biotron, Laboratory for Optical and Computational Instrumentation, and others. Many of our trainers also participate in the Quantitative Biology Initiative that brings together quantitative biologists from campus and oversees the QBio doctoral minor that Genetics students can participate in. The combination of outstanding research opportunities and options, investment in student scientific and professional development, and exceptional collaboration and collegiality make the UW-Madison Genetics Training Program a superb intellectual environment in which to develop and pursue careers in the biological sciences. We also value diversity in our community and foster a communal atmosphere among students and trainers. Our students have been highly successful in attaining diverse post-doctoral career opportunities in a wide variety of jobs related to biological research and investigation. The University of Wisconsin Madison is a leader in biological science research with over 700 faculty distributed over several dozen departments. Genetics maintains an active and vigorous presence in most areas of modern genetic and genomic research, broadly defined. The University of Wisconsin Madison offers state-of-the art facilities and technologies. Genetics offers a competitive stipend, tuition remission, low cost of living, and comprehensive benefits. Our faculty are outstanding researchers, but also dedicated teachers and mentors who are committed to training the next generation of geneticists. We have a vibrant graduate student community. Students serve on department standing committees, participate in new student recruitment, plan our annual retreat, and organize social and educational events. We also value diversity in our community and welcome applicants of all backgrounds. UW-Madison offers exceptional opportunities in professional development, including through the DiscoverPD portal that matches student interests to events and opportunities on campus. Madison consistently ranks among the most desirable American cities in which to live offering outdoor recreation, cultural programming, sporting events, and festivals. Genetic research is among the most important contemporary areas for both fundamental discovery and advancement of human health. Understanding how functional information is encoded in a genome, how genetic differences across individuals influence phenotypic variation including disease susceptibility, and how cellular and developmental mechanisms are influenced by mutation and evolution is central to the mission of NIH, and NIGMS in particular. The promise of personalized medicine and patient genome sequencing is driving an even greater demand for expert geneticists who can interpret genetic information. The Genetics Training Program at the University of Wisconsin-Madison (UW-Madison) combines an established tradition of excellence in training generations of genetics researchers with a forward-looking vision of the changing landscape of career opportunities and trajectories. Our mission is to train the next generation of genetic researchers in rigorous, responsible, cutting-edge research that addresses modern questions in genetics and genomics, while preparing students for diverse careers that leverage that training. We have had great success preparing students for diverse careers that leverage a PhD in genetics. 7% in other careers leveraging a doctorate in genetics (including an analyst for the Center for Disease Control, an NIH program officer, and a professional scientific editor). We strive to maintain a vibrant community that values diversity and inclusion in all senses, which enables the best scientific training, research, and innovations. In the fall semester of the first year, each new graduate student attends a comprehensive series of talks given by faculty who have space for graduate students in their research laboratories. Based on these talks, each student then spends four weeks in the labs of three (or four if needed) professors whose work seems especially interesting to them. The student, in agreement with the professor, will then choose one of those options as the thesis lab. Arranging these lab rotations is an important first step of each student’s program. During the first semester, students also take one of several required courses, Advanced Genetics 701. In the second semester, students will get settled in their thesis lab, take the required course Advanced Genetics 702, and complete other elective coursework if desired. At the end of the second year, the student becomes “certified”. Certification is a planning process in which the student, their advisor, and their chosen faculty committee decide if additional courses are recommended to prepare the student for a chosen research area. The student and the major professor select a certification committee of three to five faculty members from fields related to the student’s research interest. This committee will guide the student through the remainder of his or her graduate training. Core course work: Integrated Advanced Genetics for Graduate Students (Genetics 701 & 702), two roundtable methods and logic courses where students meet weekly with the invited Colloquium speaker, and four seminar courses. Students are also required to take at least one additional high-level course in genetics or genomics, and can choose additional courses based on interests and recommendations of their thesis committee. Minor course work: Students can choose to do an external minor as an add-on to their Genetics PhD, or choose to meet the UW requirement for a minor by using the Genetics major course requirements (called a ‘distributed’ minor). Other requirements: One semester of teaching assistant experience (second year), Oral Thesis Proposal Defense (by the end of second year), coursework in Responsible Conduct in Research, annual meetings with the thesis committee, and finally successful oral defense of the Ph.D. thesis. Advanced Genomic and Proteomic Analysis, Advanced Microbial Genetics, Animal Developmental Genetics, Biology & Genetics of Filamentous Fungi, Cancer Genetics, Clinical Genetics, Comparative and Functional Genomics, Evolutionary Genetics, Evolutionary Systems Biology, Genomic Science, Human Genetics, Population Genetics, Prokaryotic Molecular Biology, Regulatory Mechanisms in Plant Development, and Human Cytogenetics. Further courses in areas such as molecular and organismal biology, population genetics, quantitative biology, and bioinformatics are offered by allied departments, in addition to a wide array of seminar series. 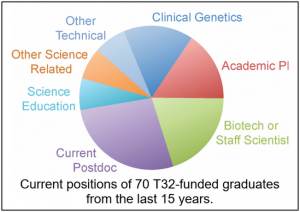 For more details, see the Graduate School’s statistics about the Ph.D. program in Genetics. For admission to graduate study in genetics, the student should have earned a grade average of B or better and completed a B.S. or B.A. degree in a recognized college or university. There are no specific requirements in supporting fields, but students are encouraged to acquire adequate background in mathematics, physics, and biology. There is no formal language requirement for the Ph.D. in genetics. The Genetics Graduate Program Admissions Committee takes a holistic approach to reviewing applications. The GRE is no longer required; however, students who have taken the exam are welcome to supply scores, which may be considered in the holistic application review. The GRE Biology or related subject test is not required, but applicants may provide scores if available. Official GRE scores should be sent to UW- Madison using code 1846. If your native language is not English or your undergraduate instruction was not in English, you are also required to submit TOEFL scores. Undergraduate research experience is also strongly recommended in order to be competitive. Complete Applications must be received by December 1, although early submission is encouraged. Midyear admissions are not considered. Most students admitted are selected during February and March. What is your personal motivation to become a geneticist? What makes it clear that you will thrive in a research-intensive PhD program? What have you discovered and personally gained from your past research experience? Which areas of genetics research interest you the most? Why is UW Genetics the right fit for you? Are there specific genetics trainers who you might like to work with? See our Research Areas section to learn about our faculty and labs. The three letters should be from research mentors and professors and should address your potential to perform Genetics research at the PhD level, in addition to your aptitude and performance in intellectual and creative pursuits pertinent to scientific research. Unofficial transcripts will be accepted for the admissions process. However, if you are offered admission you will be required to send official transcripts to the department. Please include in detail your research experiences including number of months worked, work experiences, publications and posters, honors, awards, and interests. The Genetics Graduate Program Admissions Committee takes a holistic approach to reviewing applications. The GRE is no longer required; however, students who have taken the exam are welcome to supply scores, which may be considered in the holistic application review. The GRE Biology or related subject test is not required, but applicants may provide scores if available. Official scores will need sent to UW- Madison, use code 1846. If your native language is not English or your undergraduate instruction was not in English, you are also required to submit TOEFFL scores. 1. Are you a U. S. citizen or permanent resident? 2. Do you identify as an African American, Hispanic American, and/or Native American? 3. Do you have any financially extenuating circumstances that would be aided by a fee waiver? 4. How many months or years of biological research have you conducted thus far? 5. What is your undergraduate GPA? Review the UW- Graduate School Admissions requirements. Submit your official GRE and TOEFFL scores to institution code 1846. We strive to maintain an inclusive, supportive, and diverse community that enables our world-class education, research, and collegiality. We care about our students, and we make every effort to see that they develop both intellectually and personally during their stay with us. Furthermore, we instill in our students a value of our community and in supporting each other during graduate school. We strongly believe that such collegiality fosters and supports diversity – in our student body, creative ideas, and scientific innovations. The UW-Madison Genetics Training Program invites applications from students of diverse backgrounds who are interested in genetic research and training. We especially seek qualified underrepresented minorities to the program and campus. Beyond simply recruiting students, we aim to provide diverse mechanisms of support to ensure that students are empowered to express and develop to their full potential. Please contact Martha Reck for questions you might have about our program and initiatives. If you would like to check your application status you may do so by logging into My UW. Every effort is made to check documents off of your application checklist in a timely manner, however, please allow 3-5 business days for updates to occur. If you have forgotten your NetID or password, assistance is available here. If you have specific questions about the program please contact Lauren Foley at lauren.foley@wisc.edu.